A gaggle of UKFasters headed down to London at the end of September, their sights set firmly on Kensington Olympia. We’d been excited about eCommerce Expo 2016 for a long time, especially since we were headline sponsors for this year’s proceedings. The lovely Hester has the happenings. For those of you who aren’t familiar with eCommerce Expo – we sincerely hope you don’t work in internet retail if so – it’s a vast, all-encompassing eCommerce event. Olympia’s huge National hall hosted an extensive array of eCommerce-related exhibitors, from sales platforms and web developers to PR agencies and web insurance brokers. 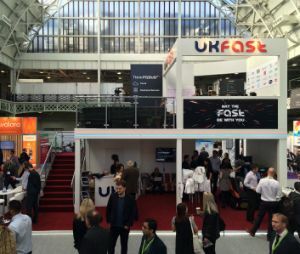 Everyone who attended commented on how the room was ‘filled to the rafters’; we are proud to say that UKFast took the phrase more literally than most. Our two-tier stand took pride of place in the centre of the venue and became a focal point, looming above the rest. It was really useful, actually, for navigating through the labyrinth of eCommerce stalls. Our building team, UKFast Space, did an incredible job with the construction and we’re so proud of them for pulling off something that no other exhibitors dared to dream of! Up top we had a board room setup, perfect for a series of round tables, led by our lovely MD, Jonathan. Over the two days, a host of industry heavyweights came and discussed Magento, customer service and key trends in eCommerce. Some of the takeaways were surprising and all were invaluable, so keep your eyes out for when the content goes live. Underneath the knowledge-sharing platform (in both senses of the word), our incredible UKFast team spent their time getting the message out about our services and ethos. We had relaxing sofas, prosecco and thousands of freebies to give away: power chargers, USBs, t-shirts, rubber ducks, pens; you name it, and as long as it was one of those listed, we had it. But the main attraction was our Pod-racing game station. The competition was fierce, and the leaderboard was crowded with impressive scores by the end of the second day. 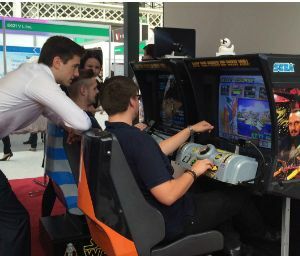 We loved seeing so many eCommerce aficionados take a trip back down memory lane and channel their long lost Jedi masters on the retro arcade units. Even our very special guests had a go – Darth Vader and Unidentified Storm Trooper took time away from the swarms of attendees asking for photo ops and tried their luck on the racers. It was a good job neither were sore losers, or there might have been serious consequences for their dire scores! 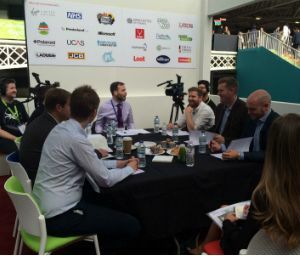 Our two-storey tower wasn’t the only UKFast double threat at the Expo; both CEO Lawrence Jones MBE and MD Jonathan delivered expert insight into the crucial elements for eCommerce success. Their talks, from generating sales and service ratings to the part played by speed, showed how crucial establishing a robust, reactive hosting system is for optimising your eCommerce venture. Watch out for more in-depth content on all this, and more. If bad things come in threes, then judging from our experiences at eCommerce Expo 2016, we reckon good things come in twos. The two days were marked by the success of our two-storey stand, talks from two inspiring UKFasters, two Pod-racing stations and an appearance from two familiar, albeit menacing, Star Wars villains. Here’s two [sic] a fantastic event! Get more expertise in our eCommerce Peak Period Success whitepaper.